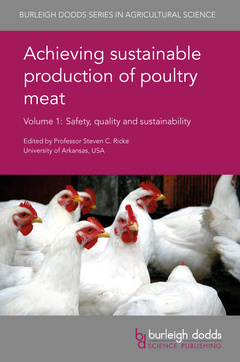 Achieving sustainable production of poultry meat RICKE Steven C.
Add to cart the livre of RICKE Steven C.
Drawing on an international range of expertise, this book reviews research on safety, quality and sustainability issues in poultry production. Part 1 discusses risks from pathogens, detection and safety management on farms and in slaughterhouse operations. Part 2 looks at ways of enhancing the flavour, colour, texture and nutritional quality of poultry meat. Finally, the book reviews the environmental impact of poultry production and ways it can be minimised. Dr Steven Ricke is the Donald ‘Buddy’ Wray Chair in Food Safety and Director of the Center for Food Safety in the Institute of Food Science and Engineering at the University of Arkansas, USA.